If you’re reading this book because you are thinking about starting a business and you just want some quick tips on how to be successful, then put this book back on the shelf and move on down the aisle, because this book isn’t for you. But if you picked up this book because you are ready to get serious about success, you’re ready to do one of the hardest things you’ll ever do in your life, and you have the stamina to see it through to the end, then open the front cover and start reading. 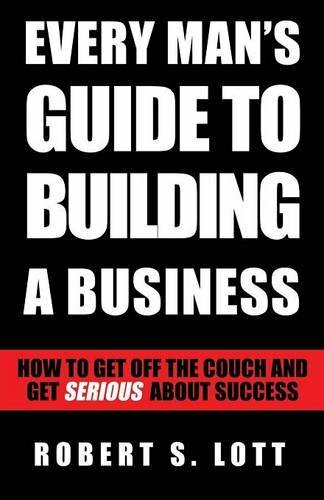 Every Man’s Guide to Business : How to Get Off the Couch and Get Serious About Success is a quick read, because you don’t have time to read a giant business book filled with a bunch of theory you’re never going to use. It’s practical and provides hands-on action steps using real-life anecdotes from a man who has lived a lifetime creating and selling businesses. Robert S. Lott’s down to earth, tell it like it is, take no prisoners style, makes Every Man’s Guide to Business a fun read that will give you just the right kick in the pants you need to start and run a successful business.